Before the Binghamton men’s basketball team played in its first America East (AE) Championship on March 14, 2009, it seemed as though everything was looking up. Until then, the Bearcats had largely been a middle-of-the-road team in the AE. BU won, earning a NCAA Tournament berth and a first-round matchup against Duke. But after that, an academic scandal emerged, leading to the removal of then-BU head coach Kevin Broadus and the gutting of the team’s roster, setting Binghamton’s basketball program back by years. It was in that AE Championship game against UMBC over eight years ago that Binghamton’s Elo rating peaked at 1,612. Since then, the Bearcats’ rating among AE teams has plummeted, stagnating near the bottom of the conference and ranking second-to-last, according to Pipe Dream’s analysis. Elo, a rating system initially created to rank chess players, has become a popular metric for evaluating the performance of a sports team’s performance at any point in time. Popularized by FiveThirtyEight’s Nate Silver, the metric takes into account a team’s wins and losses and the Elo rating of the team those wins and losses came from. The rating changes each game based on the rating for each previous game. 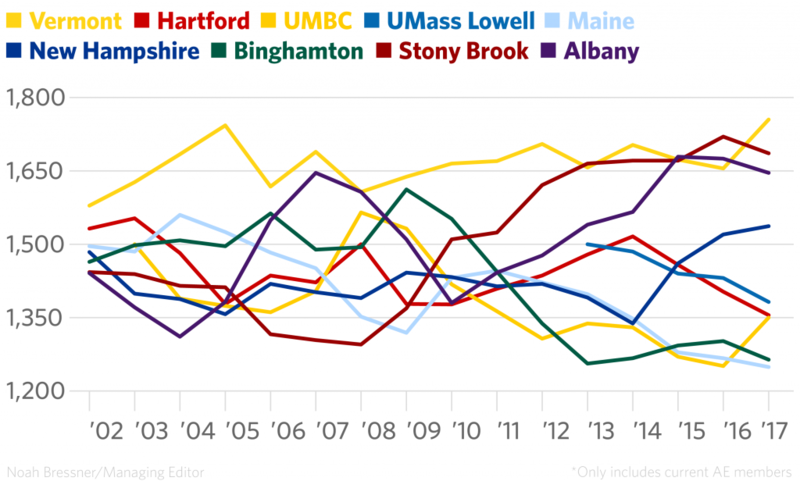 If Binghamton were to beat Vermont, who holds the highest Elo rating, its rating would increase more than if it beat Maine, the worst team according to this analysis, which includes both AE regular-season and playoff games. Going back to the 2001-02 season, Vermont has spent the most time in first place, according to Elo. The Catamounts’ current rating (1,755) is the highest of any AE team in the past 16 years — an average AE team would be expected to have an Elo hovering around 1,500. Even though teams ranked at the top are beatable, the ratings are extremely stable when looked at over the course of a few years. The system takes the wins and losses from the past 16 years and over that time period, it is relatively stable. The ratings do fluctuate, but we found that significant increases in performance are rare and typically take years. If there is a big change, however, it tends to last multiple seasons. There are, of course, flaws with the Elo rating system. It doesn’t take into account the obvious things that might cause a change in a team’s performance. Last year, redshirt junior guard J.C. Show was out most of the season, as was senior forward Willie Rodriguez, and those injuries were not accounted for in the model. It also doesn’t take into account the high player turnover rate in college sports or how experienced a team is at any given time. The Elo ratings are a better benchmark than they are an indicator of future performance. They show where the team is currently and where they might go, but not where they will go exactly. While there are other rankings that take these things into account, doing so often adds an element of bias. A poll of AE coaches ranked UMBC third, while the Elo ratings show them coming into the season third from the bottom. Binghamton falls eighth in the Elo ratings and tied for sixth in the AE Coaches’ Poll. Stony Brook and New Hampshire are both ranked lower in the coaches’ poll than in the Elo ratings. AE head coaches are more likely to take into account things like injuries and new players, but often overemphasize them. For instance, Stony Brook was ranked seventh last season in the coaches’ poll but finished second. Pipe Dream will be updating its projections as the season progresses; check back before AE play begins for updated projections and analysis.